March 2012 sees Magic of Persia once again presenting their eagerly anticipated Magical Nights in Dubai, taking place during both Art Dubai and the Iranian New Year Celebrations in the presence of His Excellency Sheikh Nahayan Bin Mubarak Al Nahayan. The fourth of its kind, this star-studded fundraising event will include an exclusive Iranian concert at One and Only Royal Mirage on 22nd March, where the internationally acclaimed Shanbehzadeh Ensemble will be performing for the first time in the UAE. That night will also feature a special performance by Mehran Atash, Winner of the Googoosh Music Academy 2011. 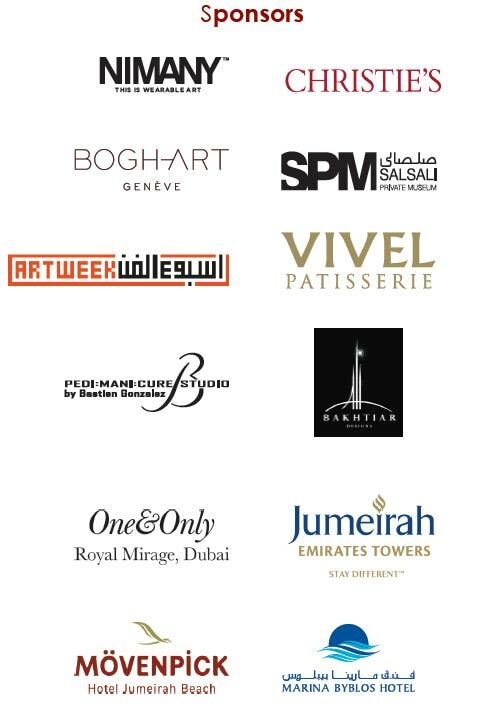 The following evening, esteemed guests and art patrons will enjoy an Auction Gala Dinner at the Jumeirah Emirates Towers. This will feature a live show of Bogh-art Jewellery followed by an auction by Christie’s, during which works donated by renowned contemporary Iranian artists will be sold. 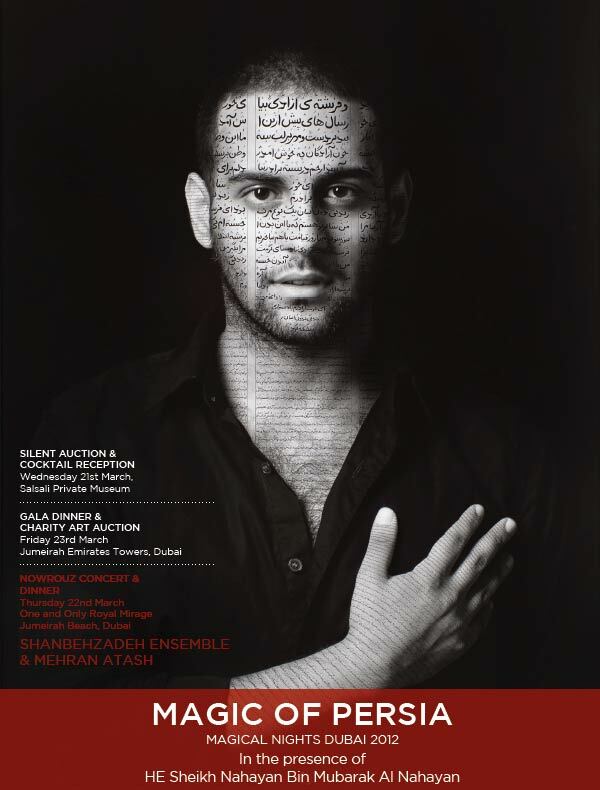 The auction includes works by masters such as Shirin Neshat, Ali Banisadr and Farideh Lashai, as well as Ramin and Rokni Haerizadeh to name but a few. In keeping with Magic of Persia’s mission to nurture emerging talent, there will also be an exhibition and an online silent auction of works by forty Iranian artists. Curated by the talented Ali Bakhtiari, this ‘Exhibition of Auction Highlights’ will take place during Art Dubai both online and at the recently opened Salsali Private Museum. Donated works by these young artists will be on display from 12th to 21st March, giving interested buyers the opportunity to view the works before bidding. Bids can be made online until midday on 21st March; at which time lots which have not been purchased outright via the internet will be auctioned live at the Salsali Private Museum during the same evening following a cocktail reception. Magic of Persia will also be exhibiting photographs taken by some of the young women who recently took part in a photography workshop led by Shadi Ghadirian in 2011. The workshop was part of The Omid Foundtion’s holistic program that strengthens the social, emotional and economic competencies of disadvantaged young women, by visually expressing their thoughts about womanhood and femininity. 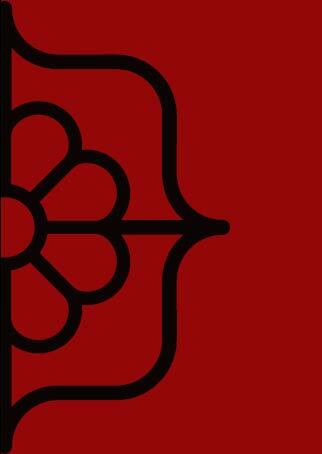 This will take place in parallel with the Exhibition of Auction Highlights at the Salsali Private Museum. The photographs in the exhibition are for sale with all sales proceeds benefiting Omid Foundations. A Ladies’ Private View of the Live Auction Highlights, in the presence of Her Highness Sheikha Shamma Bint Khalifa Bin Hamdan Al Nahayan, will be held at the Jumeirah Emirates Towers on Friday 23rd March, featuring an exclusive display of Bogh-art Jewellery. As with all of the Magical Nights events to date, His Excellency Sheikh Nahayan Bin Mubarak Al Nahayan, Minister of Higher Education and Scientific Research in the UAE, a long-standing supporter and patron of the charity, will be in attendance as the keynote speaker. Further, theming for both evening’s activities will once again be designed by the incomparable Ali Bakhtiar. Funds raised during Magical Nights in Dubai 2012 will be dedicated to sustaining Magic of Persia’s ongoing art initiatives as well as supporting Kids Company, London; the Future Centre for Special Needs, Abu Dhabi; and the Omid Foundations. Established in 2004, Magic of Persia is a UK-based charity which nurtures and develops Iranian cultural practitioners of the arts. This is accomplished by establishing initiatives promoting modern, contemporary and classical Persian art, music and media in partnership with world-class institutions. Programs include residencies for talented young artists at the Delfina Foundation, Gasworks and Visiting Arts. In addition, Magic of Persia offers several MA scholarships at the London Film School and MFA grants at the Royal College of Art. The Magic of Persia Educational Family Weekends, held at both the British Museum and the Victoria and Albert Museum, feature workshops and activities through which families can come together to learn about Persian culture and its unique contribution to modern society. This partnership between Magic of Persia and the British Museum continues through a series of informative Artists’ Talks arranged in conjunction with the museum’s acquisitions of contemporary Iranian art. One of the charity’s most established initiatives to date is the bi-annual Magic of Persia Contemporary Art Prize (MOP CAP); a global search to identify the next generation of Iranian artists. The MOP CAP nominating and judging panels are comprised of gallerists, curators, artists, and critics who are familiar with the Iranian art scene. In keeping with Magic of Persia’s goal to provide maximum exposure for the applicants, the works of all shortlisted artists are exhibited in Dubai at a leading gallery during Art Dubai. Furthermore, finalists’ works are exhibited for public viewing during Frieze Art Fair at the Royal College of Art, London. The MOP CAP winner is awarded a solo exhibition the following year at a leading arts institution such as the Saatchi Gallery. At the heart of Magic of Persia is a mission to provide much-needed opportunities for talented individuals both inside and outside of Iran; supporting them in gaining well-deserved international recognition. Through its activities, the charity strives to make a notable contribution to the long-term advancement of Iranian art and culture worldwide. Kids Company was founded by Camila Batmanghelidjh in 1996. It provides practical, emotional and educational support to vulnerable inner-city children in the greater London area. Their services reach 16,000 children across London, including the most deprived and at risk whose parents are unable to care for them due to their own practical and emotional challenges. For many, the roles of adult and child are reversed and, despite profound love, both struggle to survive. Founded in 2004, the Omid Foundations provide emotional and practical support for severely disadvantaged young Iranian women. These women are faced with relentless emotional and financial deprivation. The Charity enables them to achieve self-determination and self-sufficiency in modern Iranian society. The Future Centre for Special Needs is a non-profit organisation based in Abu Dhabi. It specialises in the education and habilitation of individuals with disabilities, who may stay at the centre between the ages of 3 and 20. The Future Centre has been an on-going beneficiary of Magical Nights in Dubai. In addition to being an incredibly worthy cause, the president of this commendable organisation is a longstanding patron and tireless supporter of Magic of Persia, His Excellency Skeikh Nahayan Bin Mubarak Al Nahayan.